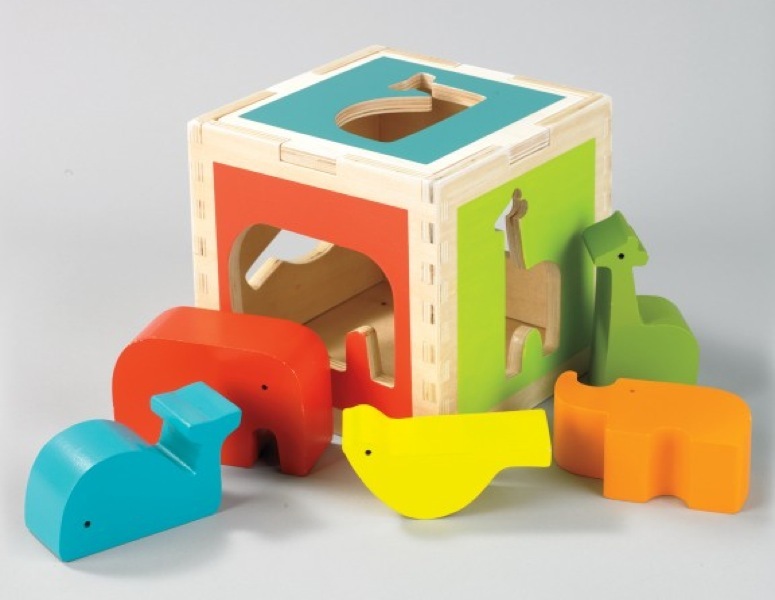 DwellStudio’s Zoo Shape Sorter will perk up any nursery and any baby’s imagination. Made from engineered and recovered wood and colored with non-toxic dyes, the zoo shape sorter is also lead-free and phthalate free. Playing with the shape sorter helps tots learn to match shapes and colors and promotes coordination and exploration as well as imagination. The punchy colors and smooth lines on the whale, elephant, bird, giraffe, and rhino also make this toy a visual stand-out on the playroom shelf as well and are easy to see when doing the end-of-day toy round-up! DwellStudio�s Zoo Shape Sorter will perk up any nursery and any baby�s imagination. Made from engineered and recovered wood and colored with non-toxic dyes, the zoo shape sorter is also lead-free and phthalate free. Playing with the shape sorter helps tots learn to match shapes and colors and promotes coordination and exploration as well as imagination. The punchy colors and smooth lines on the whale, elephant, bird, giraffe, and rhino also make this toy a visual stand-out on the playroom shelf as well and are easy to see when doing the end-of-day toy round-up!